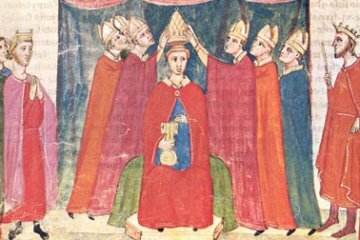 We continue our look at the history of the popes with the papacy of Benedict XI and his attempt to promote peace in Christendom after the death of Boniface VIII. Some believe that the model of Benedict XI was one of the reasons why Joseph Ratzinger chose to take the name of Benedict XVI – we will see some possible reasons why. This entry was written by sbeshonertor, posted on June 3, 2007 at 8:39 pm, filed under History, Podcast. Bookmark the permalink. Follow any comments here with the RSS feed for this post. Post a comment or leave a trackback: Trackback URL.